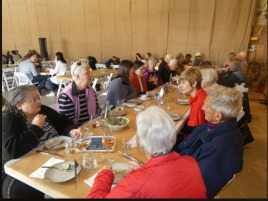 Parishioners from all corners of the parish gathers every six months at Golding Wine in Lobethal on Sunday afternoon for a fun-filled ‘Northern Lights’ get-together. The day commences with tastings in the tasting room before we moved to the main area for lunch, where a delicious pizza lunch – and a glass of wine, of course is shared. The fellowship is wonderful and a wondereful venue to share our stories. Northern Lights shine as bright as ever!